I’m excited to feature my old colleague, Nicholas Michael Ravnikar’s, piece in progress, “The New Addition”, for this conversation. Nicholas and I worked together on two flash fiction anthologies with Fast Forward Press, so I’m thrilled to revisit his work! 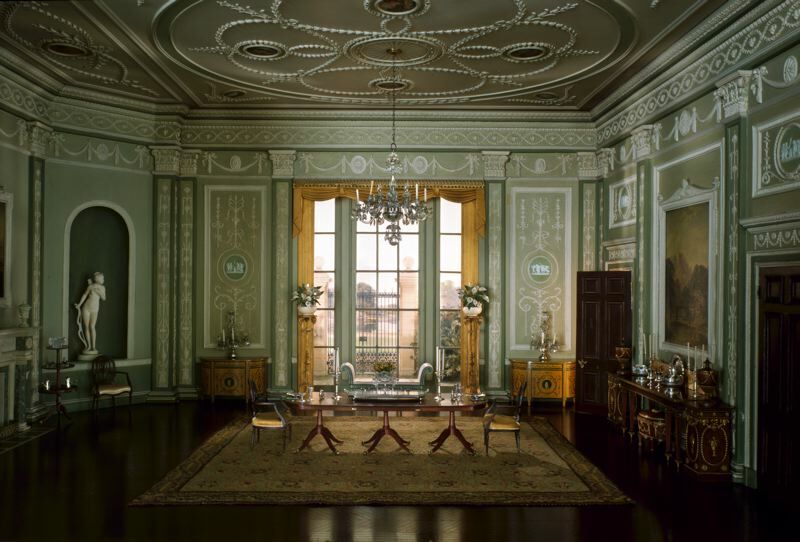 One of my favorite exhibits in the Chicago Institute of Art is the Thorne Miniature Rooms: tiny replicas of actual rooms painstakingly crafted on a scale of one inch: one foot. You press your face up to each of the 68 windows and gaze at the tiny world inside: fully formed rooms, complete with intricate period details, exotic woods, fabrics, chandeliers and hand-woven rugs. The attention to detail in each room would be fascinating even at life size, but the true fascination is the fact that they are just so damn tiny! Like painting the Mona Lisa on a grain of rice or a sculpture of Charlie Chaplin balanced on an eyelash. So let’s go ahead and debunk flash fiction myth #1 right now: Just because it’s small doesn’t mean it’s easier. Anyone who has written poetry knows how long you can agonize over 100 words. One of the reasons people love flash fiction is, like the Thorne rooms, there is something awe-inspiring about entering a perfectly formed little world. If it’s done correctly, the stature becomes part of the art: readers can’t believe they just had such a complete story experience in such a tiny space. It becomes more of a testament to the skills of the writer, not the other way around. So Nicholas, let’s talk about your piece, “The New Addition” (full text below). When I enter your piece it’s like I’m entering one of these exquisite little rooms. I’m immediately grabbed by the description of the ketchup sandwich all the way to the insect paste, and there’s an urgency that yanks me into the sentences like I’ve been kidnapped into your world. It’s so exciting. Within seconds I feel implicated in the story, as if by witnessing the action I’ve somehow participated in it. And that is really the beauty of abstract art: to invoke feelings that you couldn’t get to by more conventional ways. But there is a lack of coherence that ends up pulling me into this exotic world and then leaves me stranded and confused. And I realize I’m in touchy territory because coherence isn’t always a goal for a writer. You are admittedly in love with language, and your world is so cleverly fragmented and infused with intrigue…but I feel like you lead us into the room and don’t lead us out. And we’re so smitten that we almost want to forgive you for this. But let me offer this suggestion: even if coherence wasn’t your original goal…we want so badly to understand! Because we want to stay in this world. Therefore, if you can give us both this imagery and intrigue and the satisfaction of really allowing us cognitively into the piece, it will go from beautiful to phenomenal and have a more lasting effect. One of the ways that I think you could bring clarity to the story without sacrificing too much abstraction is to let your characters themselves be signposts: Right now the story begins with “they”, which we know includes her and someone else. Then we meet “you” narrating. Then we meet “her girlfriend” in Mexico—and we’re not sure if this is the other half of the “they” from the beginning or a fourth character. There is a “girlfriend’s drug dealer” as well as a “he’ that shows up at the end, which could be the other half of the original “they” or could be referring to the dealer. By the end of the story my brain is holding onto to all six threads trying to make them connect. But eventually I surrender and decide that in order to really get it I’m going to need to be 25% smarter. So this is actually the flipside of what I was saying a few weeks ago about trusting the reader: Trust the reader, but leave breadcrumbs just in case. Again, I realize that being crystal clear doesn’t have to be a goal. But the lack of coherence might be keeping readers at an unnecessary distance when you want them enmeshed, and I don’t think it wouldn’t take too many strategic clues to keep the reader fully engaged. Right now we’re being pulled out too often trying to make sense of it. But the bottom line is we want to stay in this room you’ve crafted, so throw us some crumbs and we’ll follow you, I promise. Ketchup sandwich in hand, the crest of winter, St. Patrick’s day. It’s around the time of the new addition. The wedding was last June. This is the first time since that they’ve slept apart. The sheet-plastic walls and the sawdust got to be too much for her. Then she thought of you, filled the gas tank and booked the same room. At least, she thinks it is. What a mouthful. No more of this. Notice the sweet summer storm sort of sunset in this photograph she’s thumbing. You never gave her this one: your shirt after the plate glass lacerations, lying on a concrete Embarcadero bench. She had to dig around for a copy online—it wasn’t hard, with your public profile. She ordered a print from the Walgreens by the overpass. The blood dyes the fabric, amplifies her pulse. When did you last investigate the seams of her tendons audibly? The telephone you left smeared with Jiffy your last night here sits beside her. She indexes your flat-naked craw, recalls how you threw the plastic salmon base cradle at her girlfriend’s dealer when you discovered them. Her loud skin, this browsing of images, and your thin grimace wondering back into her figure to arch her spine again. Slightly clad in low-thread count rough motel sham, her thighs fold over memories of you, of your calluses. More of them are like us here. Two blocks from Broadway, you meant. You could always appear tender. Or else they had assault rifles. Why did you have to see me first? You need to call babies human babies. She makes this resolution. And that helps a bit. It’s even weirder when starlit seas compound her view of the village as she leans across the harbor, squinting. The next step of her calming calls for an insect paste smeared across the map of her features. It burns some. Then it comes: a sisterly smile. Stunning. The next morning, she drives home mumbling her five-year-old response to you: Life is never normal. Nicholas Michael Ravnikar saddles the tears of Mesoamerica with committees that bloom out the windows of his hopscotch factory. “Nine years ago, I watched a fire consume a kindergarten school desk,” he says. “We poured a makeshift absinthe on the embers. Today, I delight in more sordid fancies — for instance, skateboarding after three years at twelve in the afternoon.” With 83 texts (mostly English) in circulation at many small venues online and in print, he resides between one and twenty miles from the coast of Lake Michigan, just past the northern limns of the Illinois-Wisconsin border. Look for his haiku on Facebook. November Mike Romeo has his game on!